Taxonomy: Taxonomic structure of the family. 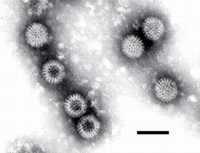 Species: Orthoreovirus; Orbivirus; Rotavirus; Coltivirus; Aquareovirus; Cypovirus; Fijivirus; Phytoreovirus; Oryzavirus. Limited serological relationships have been found among strains of viruses from humans: little or no serological relationships have been detected among viruses from other species. Host: Virus infects invertebrates, plants, and vertebrates. Genome: RNA. Double stranded. Linear. Genome monomeric. Genome in six parts. In 10-12 segments (depending on genus); total genome 18200-30500 nucleotides long. 5' terminus has a methylated nucleotide cap (on the positive strand of each duplex, the negative strands have a phosphorylated terminus). Cap sequence m7G5ppp5'GmpNp (type A). 3' terminus has no poly (A) tract. Encapsidated nucleic acid solely genomic. Genome found in one type of particle only. Each virion contains a single copy of genome; full length copy. Morphology: Virions not occluded, or occluded by protein bodies or crystals in thin sections (sometimes); not enveloped. Virions one type of particle only. Capsids isometric. Capsid shell of virion composed of two layers, or three layers; shell of virion all usually present, or outer often lost. Nucleocapsids with obvious regular surface structure; 60-80 nm in diameter. Symmetry icosahedral. Nucleocapsids appear to be round. Surface capsomer arrangement obvious. Surface projections of nucleocapsid not seen (surface apparently smooth), or not present, or distinct; spikes; restricted to (the 12 vertices). Incomplete virus particles often present; are empty capsids, or are incompletely assembled capsids. Virions only of one kind. an animal reovirus From Stewart McNulty at Veterinary Sciences, Queen's University, Belfast. Mammalian reovirus virion solved by cryo-electron microscopy and image reconstruction from the Institute for Molecular Virology - Wisconsin. Mammalian reovirus ISVP solved by cryo-electron microscopy and image reconstruction from the Institute for Molecular Virology - Wisconsin. Mammalian reovirus core solved by cryo-electron microscopy and image reconstruction from the Institute for Molecular Virology - Wisconsin. By F.P. Williams, U.S. Environmental Protection Agency. animal rotavirus From Stewart McNulty at Veterinary Sciences, Queen's University, Belfast. rotavirus Two transmission electron micrographs illustrating the appearance of negatively stained rotavirus as seen in a stool sample. From the Wadsworth Center of the New York State Department of Health.